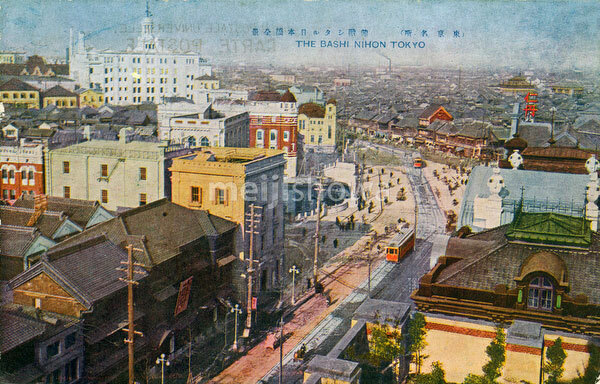 Streetcars on Nihonbashi Bridge in Tokyo, designed by Yorinaka Tsumaki (妻木頼黄, 1859-1916). The partly visible red building is the head office of Teikoku Seima Co., Ltd. (still active today as Teikoku Sen-I Co., Ltd.). Completed in 1913 (Taisho 2), it was designed by Kingo Tatsuno (辰野金吾, 1854–1919). The white building in the middle the Mitsukoshi Department Store. During the Edo Period (1600-1867), the bridge was the starting point of the famous Tokaido and the other 4 post roads. The stone bridge with bronze lions and wrought-iron gas lamps replaced the wooden one in 1911 (Meiji 44). Now hidden below an ugly highway, it is one of only two surviving Meiji-era bridges in Tokyo.